The Indian tablet manufacturer iBall, has launched yet another affordable tablet in the market - iBall Slide 3G 7334.
iBall Slide 3G 7334 runs on Android Ice Cream Sandwich and is expected to be available in the market starting first week of November. "It is the country's first dual-SIM and FM supported tablet equipped with capacitive multi-touch and seven inch screen and latest 4.0 Ice cream sandwich operating system which will be available in the market this week," Shailesh Agrawal, CEO, iBall (Rajasthan), said in a statement. "It also has the feature of video calling, dual camera and it comes with 8GB of built-in memory. It is priced at Rs. 10,990," he added. The other features of the tablet include a Cortex A9 1GHz Processor and 4400mAh battery. It has a 7-inch screen that supports resolution of 1024x600 pixels. There is a 2.0 megapixel rear camera and a VGA front camera in iBall Slide 3G 7334. Both the SIMs of this tablet supports 3G data. Earlier in the month, California-based Swipe Telecom had launched a dual-SIM Android tablet, Swipe tab All in One for Rs. 11,999. 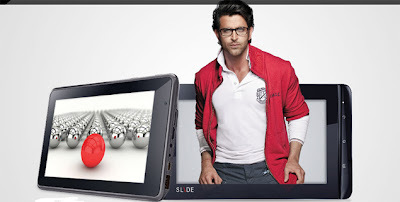 In terms of pricing, the iBall tablet is cheaper by a thousand rupees and also offers FM support. Another advantage for iBall tablet is that it supports 3G on both its SIM, while the Swipe All in One supports 2G is one SIM and 3G in the other. Having said that, we are not very sure of how having a dual-SIM can be a differentiating factor in the tablet category, or for that matter why will anyone need dual-SIM capability in a tablet? I really found that it is good as it is very useful and is convenient also which is really good as two sim cards can work together.